Provide great insurance at a great price and back it up by great customer service. Whether you need insurance for yourself, your family, your small business or your corporation we have the right solution that is nothing less than great. Simply put…Service, Technology and Innovation. We are using a disruptive business model designed to help our clients achieve the highest level of utilization and efficiency from their insurance experience. VPIS deploys our Triangle client management model. 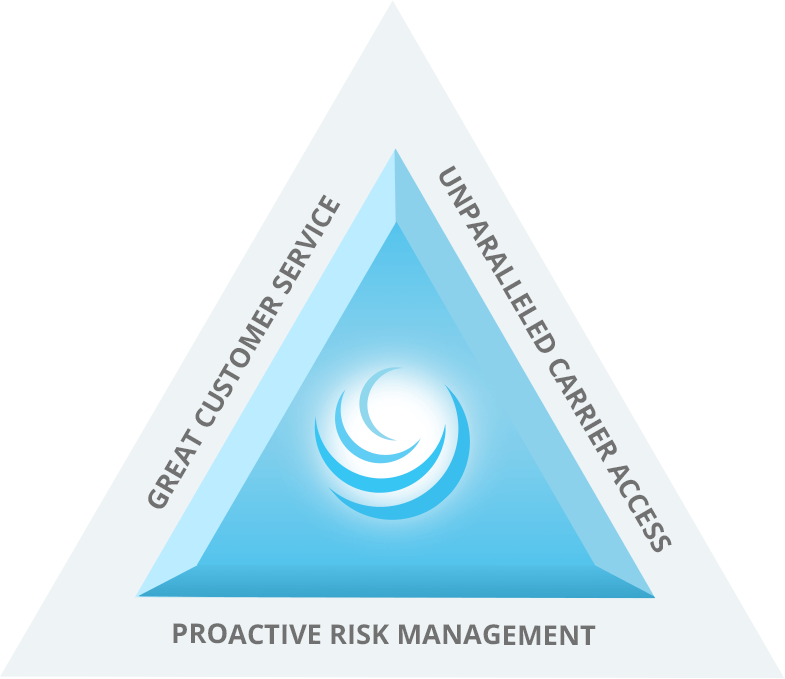 We feel our clients need a three-pronged equilateral risk management tool. Why a Triangle? Three equal sides and three angles that when placed together form a strong base. Our three-sided risk management approach utilizes each side supporting the other ultimately strengthening our customer service base. The Triangle concept for decision making states that when evaluating and making a decision you can only choose two points of the triangle and concede one. We believe in a three-point approach where our clients are not required to concede a point. We don’t believe our clients should have to sacrifice one point over another. Let’s face it we are a service based industry. Customer service isn’t a buzz word at VPIS it’s our culture. We exist as a business because our clients have given us the opportunity to service their insurance needs. Let’s face it, life is about options. Not every brokerage has access to the same carrier partners. VPIS has positioned itself to satisfy our client’s economic needs while not sacrificing their coverage forms. How are we able to do this? Through our affiliation with United Agencies, Inc., an Insurance Journal TOP 100 firm, we have developed strong carrier relationships. Although the number of carrier partners gives us tremendous flexibility for our clients, we have chosen to partner with the most technologically advanced and forward thinking carriers that offer global, national and regional solutions. Venture Pacific Insurance Services philosophy is to augment the organization’s internal teams with a host of critical business support systems. The ability for an organization to recognize and commit to being proactive in the prevention of occupational hazards, perpetuate safety and loss control programs, adhere to OSHA compliance regulations, consistently maintain claims management procedures, and evaluate human resource practices will aid in the preservation of assets against detrimental loss.